My neighbour Debi and I attended the last farmers markets of the season in December; an indoor market with so many beautiful items displayed for our perusal. 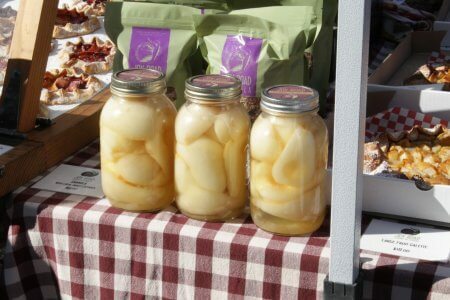 Just like the Summer Farmers’ Market in Penticton, every Saturday morning, the vendors bring their fresh fruits, vegetables, flowers, honey, wines, ciders, plants and every manor of cooked and prepared foods. For instance we sampled cashew cheddar and gluten-free ginger cookies this fall. Absolutely delicious. Getting back to the last of the farmers markets though, a surprise for us was the Cherry Juice! Organic, pure, no sugar added; just straight up cherry juice. Although it came in a 3 Litre carton, we were able to share this wonderful treat. It made the best drinks! G and T with cherry juice was a great hit. As well, Debi make up a cherry juice and sparkling water spritzer which was thirst-quenching as well as tasty. 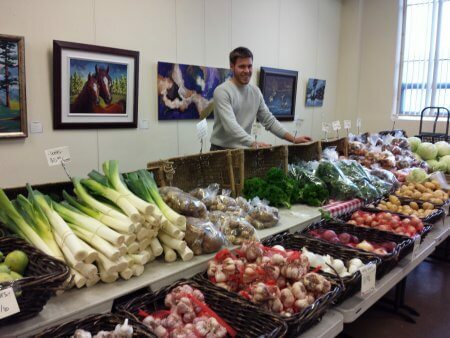 What impressed me the most at this Winter Farmer’s Market at Shatford Center was the abundance of wonderful fresh vegetables, even in December! Honest Food Farm from Cawston (http://www.bcorganicfarmers.com/farms/honestfood/index.html ) was where I spent my money. The vegetables were fresh, clean and beautifully displayed, not to mention the very reasonable prices for such great quality. I could hardly walk out of there with all my treasures: leeks, a bag of small squashes (just right for two people for dinner! ), garlic, onions, broccoli; absolutely the best. The downside? I have to wait until May to start at the first Farmer’s Market of the Season again… sigh. Know that when you stay with us at the Blue Iris B&B we buy almost all of our breakfast supplies from locally-sourced farmers and vendors. We are surrounded here in Summerland by orchards of all kinds. From these, we make our own apricot jam, pear marmalade, apple butter, peach ginger jam, as well as all the fruit compotes for topping our homemade granola. Its fresh right here in the Okanagan! You can’t get better than that.